Crystal King later showed up as the focus of a guessing game I made, and as a skin on Planet Koopa. Dude was great. 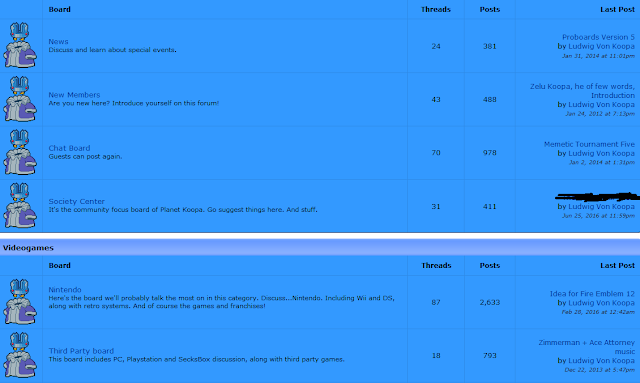 You can clearly tell that throughout my Internet life, I haven't picked up making web pages look good. Is it a bummer that we won't have our imaginations captured by the lure of original characters (besides Huey, who is already looking a lot better than Kersti) in Paper Mario: Color Splash? Yeah, but consider that original characters in Paper Mario aren't always successful. Everything on-screen except the plumber himself is an “original character”. I'm happy that King Croacus in the centre didn't become a series mainstay. We already have to deal with Petey Piranha. The downside to making a new cast of original characters every new RPG is that they don't get to come back in the next game, with very few exceptions that you see more of in the Mario & Luigi series. Some of these characters are based off of existing Super Mario series dudes, such as the Koopa Bros., Goombella, or the Underchomp. Others are totally new character designs, such as Tubba Blubba, Flurrie, or O'Chunks. I think there's a noticeable trend that, between Paper Mario and Super Paper Mario, as that trio progressed, it was focused more on the original characters than the guys based off the established world. There isn't a lot that's actually wrong with that, but you COULD call that the Kingdom Hearts effect. Now Kingdom Hearts is a lot less about Disney and a LOT less about Final Fantasy at its present point in the series than it was when the series first started. Instead, it's all about its convoluted plot with its original characters. Perhaps the guys at Intelligent Systems, or Shigeru Miyamoto, saw something wrong with that. So we got Paper Mario: Sticker Star and Paper Mario: Color Splash. You don't need original characters to create an original or interesting plot. The guys at Intelligent Systems will tell you that the restrictions on how they can shape the plot can actually fuel creativity. In the case of Paper Mario: Sticker Star, those sudden restrictions created mid-project (when a “Paper Mario: The Thousand-Year Door 2” had its table overturned by Shigeru Miyamoto) depressed creative output and Intelligent Systems clearly failed to reach the challenge. This was roughly how Intelligent Systems was treated when making Paper Mario: Sticker Star. Things have now changed. 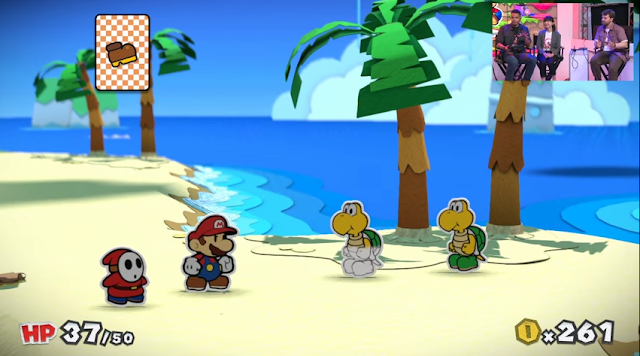 The developer featured in Nintendo Treehouse Live, Risa Tabata, said: “I think this Paper Mario, more than any other one, has the craziest scenarios just come up out of the blue. [...] We just tried to put as much interesting events and fun stuff in this game as much as we possibly could.” That's very different than Paper Mario: Sticker Star. There's also attention to detail everywhere in this game, especially the graphics. Nintendo made a big deal about there actually being a story this time, such as not wanting to spoil the game's story. Frantic, crazy, funny action? That's classic Paper Mario. We're going from Paper Mario: Sticker Star where the developers were literally saying that you don't need a story and spoiling what might be the game's most entertaining moment to hyping up a story and not wanting to spoil it. That is a very different mentality shift. It shows. Intelligent Systems knows EXACTLY what they're doing! 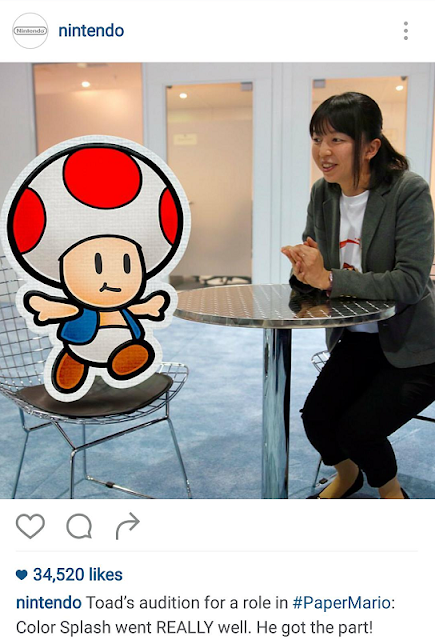 KoopaTV plans to document all of the Toads and their unique personalities when the game comes out. People also attack Paper Mario: Color Splash for gameplay reasons. For one, they believe the gameplay is a photocopy of Paper Mario: Sticker Star, which had a lot of gameplay problems. For two, because it's not like the old Paper Mario games. For the second point, people bemoan the loss of partners and badges. For the first one, people bemoan disposable-item-based gameplay and the lack of after-battle rewards. The lack of after-battle rewards is a total falsehood. You get these rewards: Coins (as you did in Paper Mario), paint that refills your metre (similar to overworld flowers for Flower Points in Paper Mario), paint globs that increase your paint metre when you acquire enough (experience points), and enemy cards. That last one has no equivalent, but it's this game's version of partners. They're just temporary (like a Pikmin) and probably a lot weaker than a Paper Mario: The Thousand-Year Door partner, but likely comparable with a Paper Mario partner. ...Strictly in terms of gameplay. If you want to moan about lack of partners from a story perspective, you'll have to explain all of the deep character development for the partners you get in Paper Mario, Paper Mario: The Thousand-Year Door, and Super Paper Mario. I think, if you look back objectively, you'll find that there really was not much that most partners (besides Vivian — Rawk insists that this article is relevant to Vivian's development) offered to make the story better. And they didn't actually develop all that much. Huey may be a Tippi-level partner in terms of story progression and development, except also with likability. Shy Guy will fight for you and be a meat-shield for you, similar to how I treated Flurrie in Paper Mario: The Thousand-Year Door. Anyway, there will be multiple kinds of enemy battle cards, not just weak and worthless Shy Guys. Koopa Troopas and Buzzy Beetles are also confirmed, and having a generic Koopa Troopa is already better than having Koops. Let me explain the paint metre, because it totally changes how the battle system works. Paint, in battles, is basically an attack-buffing system that doesn't cost a turn and is individual for your attacks. You can buff your attacks with paint to make them more powerful and give them special effects. This decreases the amount of paint you have, obviously. It's... basically an added layer of Action Command, in that Action Commands also make your attacks stronger and make things have special effects, like splash damage on your hammer. Except this isn't reflex-based and is number-management-based. RPGs love their number-management. Good sign. The fact that you gain more maximum paint after enough battles is a sign that battles are not worthless — if you avoid battles in Paper Mario: Color Splash, you will be much weaker. You know, just like a Paper Mario game. Special paint globs have that horizontal metre on the top left appear. Once it's filled up, your MAX paint increases. Mario can perform multiple actions/cards per turn. 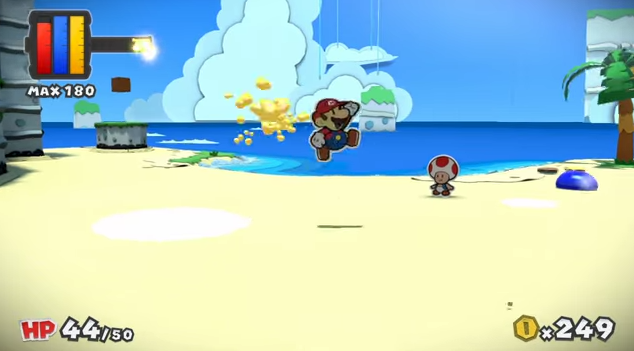 Is there much of a gameplay difference between Mario using a Jump command and Goombario using a Headbonk in Paper Mario, and Mario using two kinds of Jump-based commands in one turn in Paper Mario: Color Splash? There are also double or triple attack cards that are three attacks in one card. 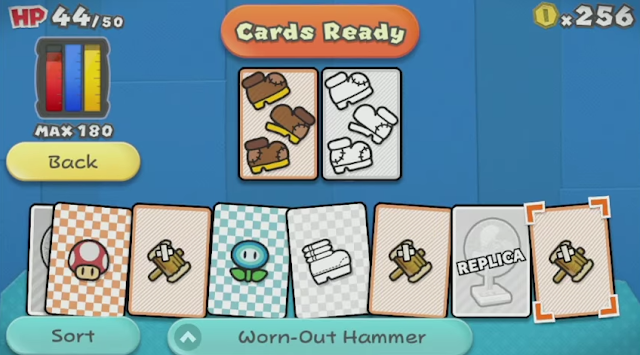 And, is there much of a difference between equipping a Badge to use a special kind of attack in Paper Mario that is a modification of a Jump or Hammer, and playing a disposable card to use a special kind of attack that is a modification of a Jump or Hammer in Paper Mario: Color Splash? What difference, at this point, does it make? The Sound FX badges? ...Things like the Power Rush badge? Personally, I had a lot of fun playing Paper Mario WITHOUT badges. When I did use badges in other playthroughs, I didn't make badge-based strategies and invested my Badge Points in attacks like Quake Hammer. Yeah, it's a little different for Paper Mario: Color Splash, but you'll find a lot of functionality replicated and new functionality included where there isn't a replacement. And just because it's different, doesn't mean it won't be fun. This is the card-selection screen. There didn't seem to be obvious inventory restrictions, and two attacks are by default. I've heard a lot of complaints that “Things” are back. 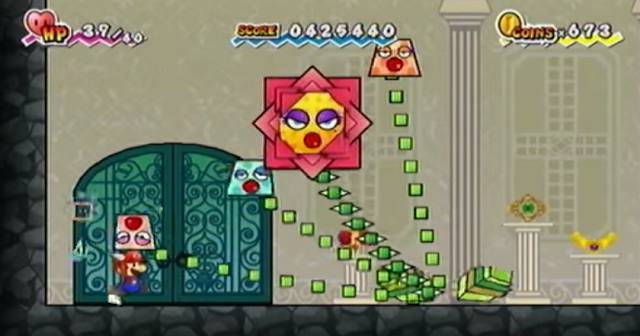 Those were the real-world sort of objects that were monsterously powerful as stickers in Paper Mario: Sticker Star. You needed them to “solve” boss battles that were basically impossible otherwise, and also to solve overworld puzzles. But since these were disposable and also missable, people ran into problems. There was also an in-game sticker Museum that encouraged you to deposit new stickers there, so you wouldn't have them for the puzzles or battles unless you backtracked. See the screenshot above? There is a Fan card at the very left, a bit off-screen. At the right, there is another Fan card — a replica. We know nothing about replica Thing cards besides the above screenshot, but it proves that you can have more than one Thing card in your inventory at once. Whether replicas are exact copies or are weaker remains to be seen, but this already seems to solve a problem, does it not? Is it possible to be able to tank being hit for 48 damage a turn and still win the boss battle without using the fire extinguisher? At least, in the Treehouse Live segment they actually said, “this game does a great job of equipping you with the tools you need, and you need to instead of blindly charging into battle, think about what you have in your arsenal.” The double usage of the “need” may turn people off, but pros should consider it a challenge. After all, if Paper Mario: Sticker Star didn't “need” characters or story, does Paper Mario: Color Splash “need” Thing cards to win boss battles? 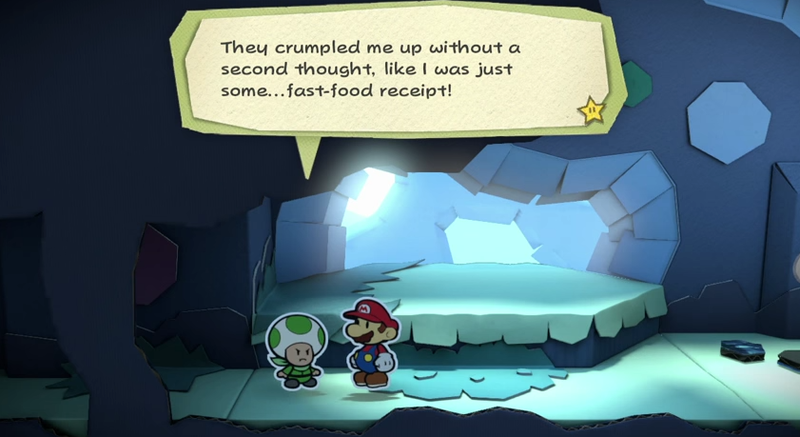 For a game that is accused of not having characters or story by detractors, Paper Mario: Color Splash is already doing a great job with its dialogue. Paper Mario: Sticker Star never caused a huge commotion among social justice warriors with its very limited and okay writing, but Paper Mario: Color Splash has. You need great, non-bland writing to do that. Social justice warriors demand blandness from artistic endeavours, so take their triggering as a good sign that Color Splash is a cut above its relatively bland predecessor. 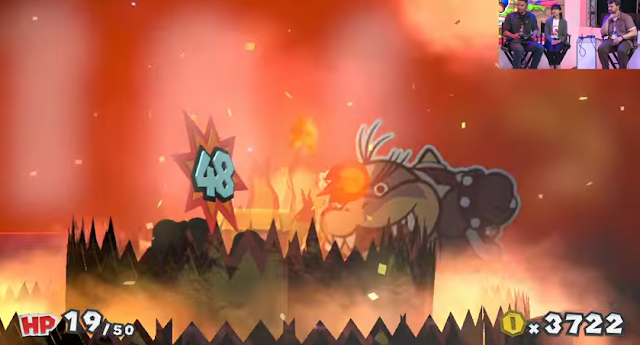 ...Oh, and, y'know, the Koopalings are in the game. With apparently exaggerated personalities. I'm scared of what Intelligent Systems might do to me, considering they made my brother retarded. 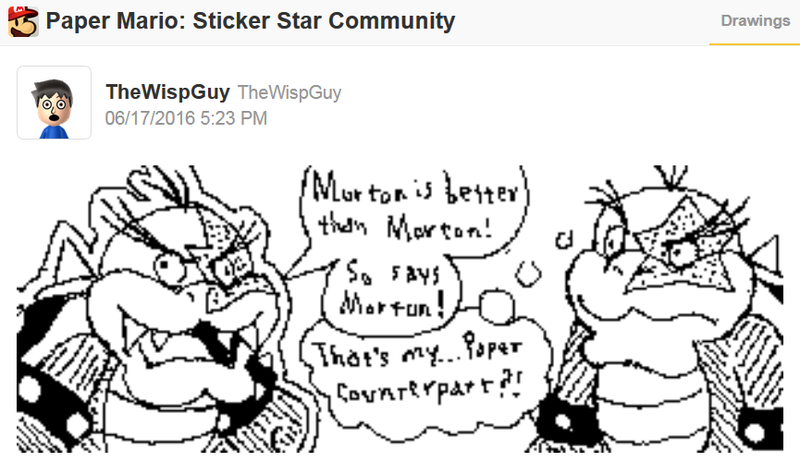 I hope they base me off of my writing here, not those creeps on Miiverse. Here's the bottom line: The developers have learned some lessons from Paper Mario: Sticker Star. This time, this is a project they WANT to do, not a project quickly put together because Shigeru Miyamoto threw out what they were working on up to that point. It doesn't need to be Paper Mario or Paper Mario: The Thousand-Year Door or Super Paper Mario to be fantastic. ...Uh... as for the validity of judging things by their first trailers? I'm not going to change that. Like President Barack Hussein Obama, marketing departments know exactly what they're doing. Ludwig hopes that Paper Mario: Color Splash makes Paper Mario great again. He'll be buying it. Not like there's anything else to get on the Wii U for the rest of the year. Follow Ludwig on Miiverse at NNID PrinceOfKoopas, because he'll be posting a dialogue dump for all of his lines like he did for Mario & Luigi: Paper Jam! And he makes good posts anyway. Are you mad at Ludwig's line about Koops? This article was written for you. Since Ludwig himself is in the game, he clearly wants it to be the best it can be. His battle does not appear to require a Thing card. Nintendo released another trailer, and one way or another, we know Paper Mario: Color Splash has a much better handle on story-telling than its predecessor. Ludwig concludes that he's wrong about Things in this article after playing the game, but says everything else in this is right. How do the statements in this article hold up to a full review of Paper Mario: Color Splash? Click here to read said full review! When Color Splash was first announced, it looked like the beloved series had met its end. In retrospect, it was too early yet to judge how the game would turn out. After watching the Treehouse gameplay footage, I clearly see how wrong I was. This game is not only visually stunning but appears to bring the series back to its roots. Although there may be a drought of Wii U games ahead, there's no reason to worry because this game is going to make a splash! Anyway, they said at the end of the Sticker Star Iwata Asks that Sticker Star would be the future of the series. Though that seems to be true, that doesn't mean they can't do it...right. I once was an ambassador of NF Magazine on Nintendo Life, so I do do tend be a little persuasive. I'm beginning to think I should change my course of studying to marketing. Oh, and by the way, if you like posters, exlusive content, or just Nintendo content in print form, then NF Magazine is the one for you! Whoops, it looks like I got a little carried away again. Uh, wot's your current course of studying? I'm studying to be an accountant. Hey look, you referenced that game. Was it because of me or would you have thought of that yourself? It's most likely your fault. I knew about the general situation before you brought it up, but you kept it in my memory. *cough* That "Kingdom Hearts effect" you mentioned happens to reference my favorite thing about the Kingdom Hearts series, since I'm completely in love with its own plot and consider the Disney/FF stuff to be window dressing. You know, I think the major difference between us when it comes to Color Splash's story is that you trust them when they say it's crazy and fun and has a story to spoil. I don't. They claimed Sticker Star's Toads had distinct personalities, too, and that the game had very funny dialogue. I've relented somewhat about Color Splash's gameplay. It doesn't have to be a disaster. Having a reason to fight battles is a definite improvement over Sticker Star. But I don't trust it from a story perspective yet. You... enjoy that convoluted mess? It's not even convoluted to be ironic like Killer 7 or something. Yes, I trust Intelligent Systems. The reason that we consider Sticker Star to have had a disastrous development is because Shigeru Miyamoto trampled on them. Otherwise, we consider Intelligent Systems to be competent. For Color Splash, they are left to their own devices. That's a much different situation than Sticker Star — therefore, it is not right to hold Sticker Star against Color Splash. Well, at least we've convinced you halfway so far. PROGRESS. I love it. I adore it. I think about the plot and characters every day, and I can't WAIT to play Dream Drop Distance and finally catch up to everyone else on the story. Also, up until DDD (which apparently introduces time travel and probably makes things more convoluted as a result), it's not nearly as confusing as people claim, if you pay attention to the story as you play. Seriously, I love the KH story on, like... Ace Attorney levels. ...Back on topic, I'll wait patiently for Color Splash reviews and what they say about the story. "I think about the plot and characters every day"
Time travel on top of all the other crap? YIKES. (As someone who played through the vast majority of KH 1, the FF dudes just made cameos and the original characters were more-or-less designed to be FF dudes. Yep. I love the characters. Especially the villains. Hey, what have you got against time travel? When done properly, like in Steins;Gate, it can be awesome! I think FF was put there initially to give it more of a boost and get the fans interested, when otherwise they might have ignored it as a weird Disney game. But aha! You just gave yourself away! From what I've seen, the majority of people who consider the Kingdom Hearts story to be too convoluted and confusing have only played one or a few of the games. (In particular, they tend to skip the non-numbered titles, not realizing that they aren't "spin-offs.") When you play all of them, the story really isn't that hard to follow. Time travel should be fine if you planned for it from the beginning and if it's centralising. You shouldn't add time travel halfway (or worse) into a series, though. After I made that comment, I listened to a bunch of Sephiroth's themes in Kingdom Hearts a bunch of times. Do Final Fantasy people even show up anymore? Not counting that The World Ends With You dweeb. I refuse to pass judgment on Dream Drop Distance's time travel until I play the game and see it in action. KH, Chain of Memories, KH2, and Re:coded all have FF characters. 358/2 Days does not, except a Moogle. Birth By Sleep included one Final Fantasy character, Zack. I haven't played Dream Drop Distance yet, so I don't know how many it has. (TWEWY is not Final Fantasy, so of course they don't count.) χ heavily features FF characters in its medals, and at least one in the story. I'm 99.9% certain Kingdom Hearts 3 will have Final Fantasy people in it. Something something Color Splash. 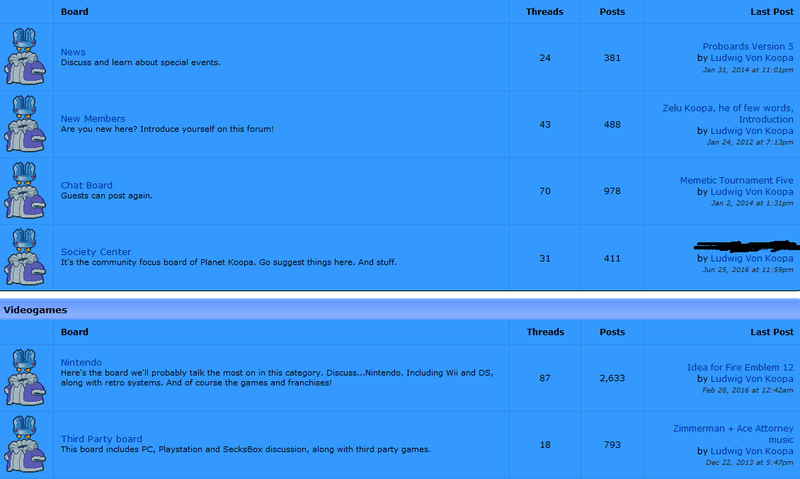 I mean really, this article is about Color Splash, we shouldn't derail the conversation entirely with Kingdom Hearts. One dude doesn't sound impressive or worthy of being a crossover at all, I gotta say. Comments section discussions usually get derailed anywho. You're the one who never really commented on why I have trust in Intelligent Systems this go-around. Zack was the only one in Birth By Sleep because it's a prequel, so they wanted to have a backstory/prequel FF character in it. But regardless, I wouldn't consider Kingdom Hearts a crossover. Not at all. Not even the first one. Good point. Righteous anger burned within me, and in my need to defend one of my favorite series, I forgot. Okay, so you trust Intelligent Systems because Color Splash is truly their game, unlike Sticker Star. This still holds even though it's clearly following Sticker Star's design (in some ways)? And you really, honestly believe that the reason they haven't shown much of the story is because it's the only way to avoid spoilers? By the way, how do you feel about the level select style of navigation? 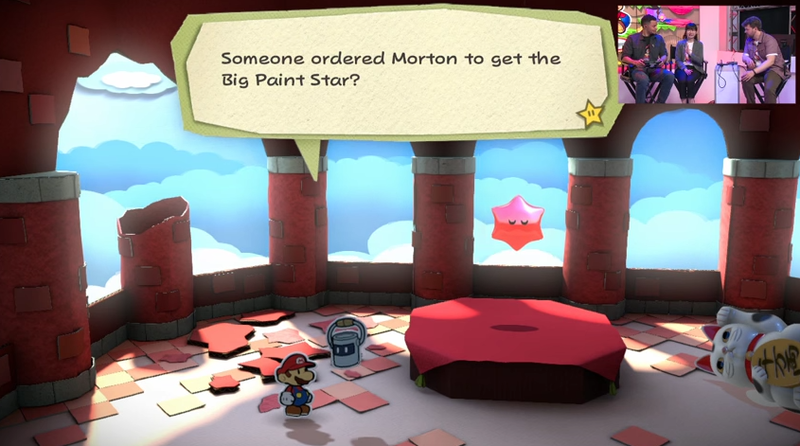 It was one of the things I disliked about Sticker Star, and I wasn't any happier to see it return in Color Splash. It's not like Paper Mario games are normally known for their connected overworlds. Mario & Luigi series, yeah, but don't forget you mostly got around in Paper Mario: The Thousand-Year Door via warp-pipe. Then I want a hub area, preferably one filled with interesting characters and side activities. Well, Prism Island looks like some kind of hub. Or it could just be like Toad Town in Sticker Star, which ain't a hub.